Up until last week, I have always had one model or other of a wireless netgear router. 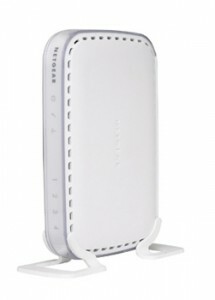 I’ve found the netgear routers work really well and are easy to manage. However with my purchase of a 11in Macbook Air, I needed someway of sharing files without my Air being at home all the time. I’ve used various NAS drives and even an HP Mediasmart server for this role, but I’ve never found something that fits my needs. I’ve always looked at the Apple Airport Extremes as a nice choice, but the price has put me off in the past. However I bit the bullet on one to get the best Wifi speeds I could with the Air’s Wifi only specs. 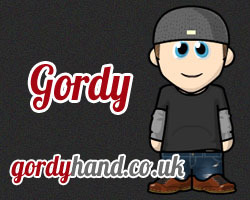 I thought I would try it out and try out sharing using it for a week and see how it went. I was most impressed. However it has one major downside. No integrated ADSL modem. I was using my existing Netgear router for that, but it seemed overkill. 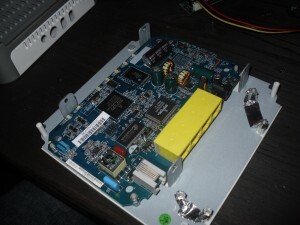 So I picked up a 2nd hand Netgear DG834 wired router off ebay. 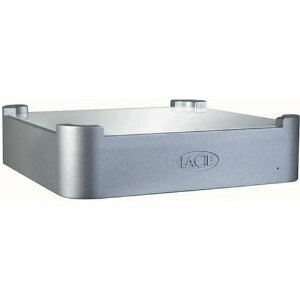 I had it in my mind that I would use this in addition to the Airport Extreme. Whilst I was waiting on the router to arrive, I got to thinking that it would be nice to have some that matched my Airport Extreme or at least didn’t take up more space. I hit upon an idea, what if I put the routers circuit board inside a matching hard drive enclousure? 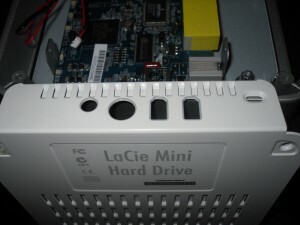 I’ve had an old Lacie Mac Mini Companion drive in the loft for a while and thought it may work. After taking apart the router and the lacie mini I tried for the first time to fit the circuit board of the DG834 into the space. It fitted to the milimeter. I couldn’t believe my luck. 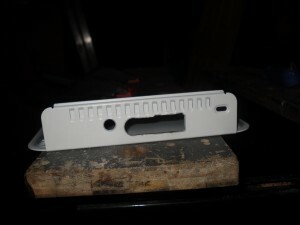 I then took some plastic standoffs and glued them in place using hot glue. These would hold the router circuit in place. I next needed to expand the holes at the back of the enclosure to allow the cables to exit the router. It is a bit rough and ready, but does the trick. It won’t be seen from the front anyway. 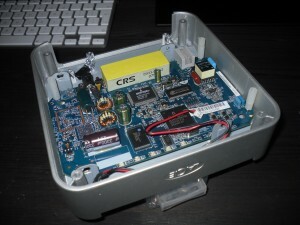 I then built the enclosure back together. With that done it was time to put the router in place and see how it worked. You can see in the above shot, that I put some extra spacers above the board. They give the board more support when the lid is in place. 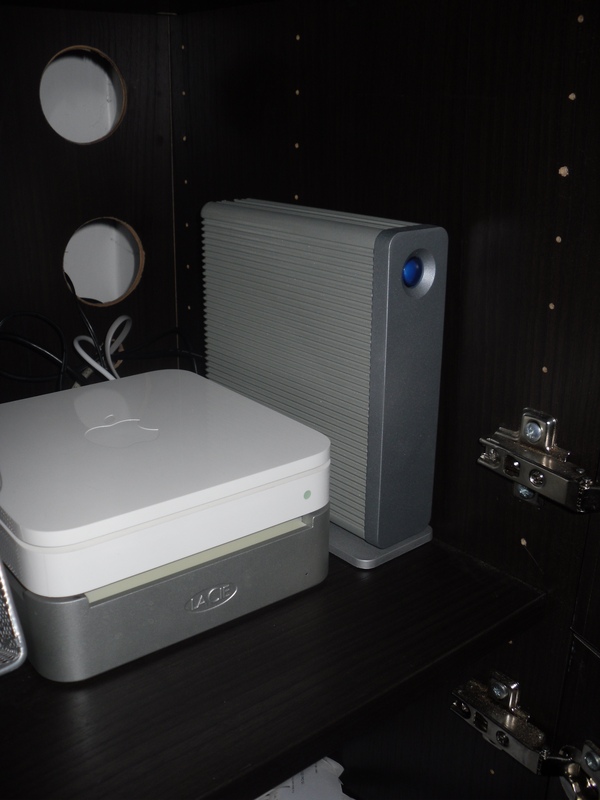 It sits underneath the Airport extreme very nicely. It required a bit of tweaking of cables, but it now stays in position perfectly. The hard drive next to it is the one I store all my films/music/etc on. The added bonus of doing this is that the Airport extreme and Netgear DG834 seem to run much cooler. They are shut in the cupboard 24/7 with no issues. So finally my fast silent way of sharing files is done.